Humans are naturally curious creatures. When my kids were little it was such fun to watch them learn about their world. Give them a cardboard box, plastic spoons and nesting measuring cups and they would experiment endlessly. Somewhere along the line, many of us got our curiosity drilled out of us – probably due to out-dated teaching methodologies in school and later, dreadful training tactics in the workplace. 25 years ago technology was touted as the knight in shining armor that would sweep into our classrooms and corporate training rooms and banish all boring training. (Remember “just-in-time” training?) Well, some e-learning solutions were better than others, but over the years, we professionals in the learning and development space figured it out and have (more or less) successfully integrated technology into a blended learning format that pairs the best of “live” learning with well-designed e-learning. Many would argue that we humans have been doing DIY learning forever, and in a broad sense, I would agree. 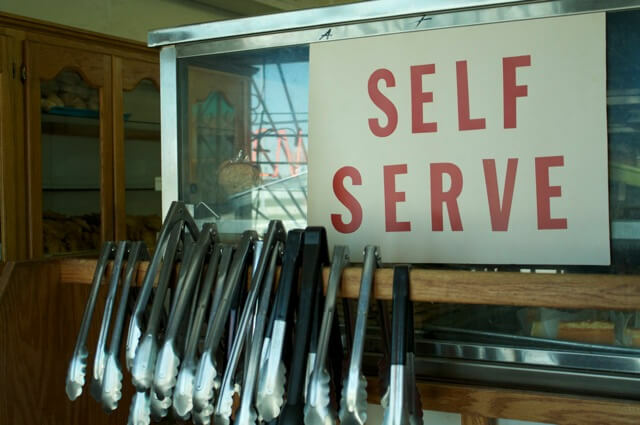 What makes the concept of “self serve” relevant today is that now, more than ever, people want to drive their own employee experience. From “Bring Your Own Device to Work” plans, to choosing a la-carte employee benefits, today’s employees demand to participate more fully in their work experience. As technology continues to allow employees more access to learning when they need it and in a format that matches their unique learning style, employers will have more opportunity than ever to develop their workforce talent. And let’s hope that soon all employers — not just those voted “best” in their industry — will see the need to offer self-serve style learning to all their employees, not just the chosen few.